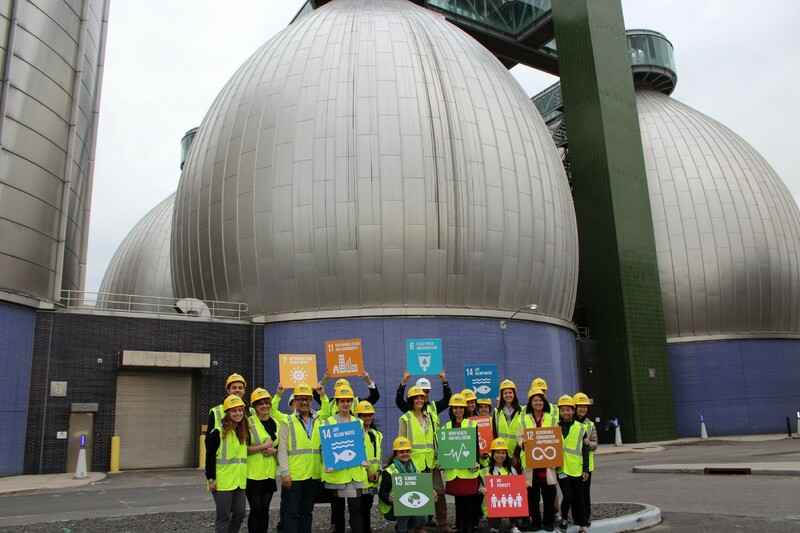 IMAGE DESCRIPTION: A group of NYC and UNDP employees stand in NYC hardhats and vests, holding up signs to represent the Sustainable Development Goals, in front of the Newtown Creek Wastewater Treatment Plant’s Digester Eggs. Every city has a different language for thinking about problems, a different governance structure, a different way of planning and prioritizing urban challenges, and a different way of implementing strategies and accountability measures. Earlier this month, when I joined colleagues from Mexico City, Mumbai, Nairobi, and San Jose at the Global Ambition, Local Action conference hosted by the City of Los Angeles and Occidental College, I was struck by how we struggled to compare our cities in our first conversations about sustainable development. But over the course of the workshop, it became apparent that the Sustainable Development Goals (SDGs) were a common language we could use to discuss our different city’s priorities in practical terms, and also to identify gaps where we could learn from each other. The SDGs give us a shared language to speak, and this was a promising start to what I hope will be an ongoing conversation with a growing number of cities. What are the Sustainable Development Goals and why are they relevant? In September 2015, world leaders gathered at the United Nations and committed to 17 goals to end extreme poverty, fight inequality and injustice, and prevent the harmful effects of climate change by 2030. To achieve these Sustainable Development Goals — also called the SDGs or Global Goals — all countries, including the United States, must do their part to make our world’s future better. These same goals were reflected in the thinking of Mayor de Blasio in April 2015 when he launched OneNYC, a groundbreaking sustainable development plan that charts a path forward to lifting 800,000 New Yorkers out of poverty, expanding access to nutritious and affordable food, and ensuring that those on the front lines of climate change — often the most vulnerable New Yorkers — are protected. Through Global Vision | Urban Action, the NYC Mayor’s Office for International Affairs is using the SDGs to share NYC’s innovations in sustainability with cities and countries around the world. We’ve identified the connections between the SDGs and OneNYC. We’re getting NYC’s diplomatic corps — the largest in the world — out of the UN and into our communities to see firsthand how New York City is putting policies into practice and learn about our shared challenges. We’re bringing city voices to inform UN policy debates about increasing economic opportunity and achieving equity through technology. And we’re sharing our methods for tracking and transparency. While the Global Goals were agreed at the national level, cities are at the frontline of taking action. Every day, we feel and see the challenges that the Global Goals address, on our streets and in our communities. As a city, New York City has the opportunity to create strategies that are responsive to these challenges. Looking at the SDGs and OneNYC side by side, we see the ways that NYC is part of a worldwide effort. We aren’t alone in trying to eliminate poverty; we’re part of a global community trying to do this together! City-to-city diplomacy is critical. More than half the world’s population is living in cities, and that means solutions to some of humanity’s toughest challenges will be found in them. On so many issues, cities in the United States and around the world are united, and we can use the SDGs and other shared objectives to promote our values and to speak a common language. To learn more about the links between OneNYC and the Global Goals, visit our website and follow us on social media. We also welcome any questions or suggestions!